Last night we ventured downtown in a swirl of Portland mist and setting sun. We were out on a mission. An outing. An adventure. First and most importantly my daughter had a gift card to an accessories store that had been burning a hole in her pocket since Christmas. She was in desperate NEED of new earrings, like RIGHT NOW!!! The aforementioned store only exists inside malls. Malls are not exactly what I would consider a joyous place to spend the day (usually… I make exceptions from time to time for certain malls for specific reasons…). For reasons known only to the universe though my daughter, much like other nearly 8 year old girls I assume, loves the mall. She jabbered with excitement as we took the short trip into downtown. She giggled with joy. I thought it was just because she wanted to go earring shopping and go to dinner, so imagine my surprise when she asked, once again “Mama, when you get your knew iPhone can I please PLEASE have yours. It’ll be just like a Touch then”. Yes the mall trip was not just for earrings, food and wandering. It was a mission to get me a new iPhone. Finally. I’ve had my iPhone for over 2 years now. It’s the original model and it has served me well (quirks and all)… Until the end of 2009 when it started acting a little funny. That post over there <— the one I just linked to? Did you read it? I’m totally about to reference it so. I was upset when my phone started to go into death spasms (which was my nickname for it’s sad rattling vibrate function). I was irritated when it slowed down and had to think about what it was doing. I was pissed off when it didn’t let me answer calls and decided it had no sim card. Until I realized what I’d put that poor phone through. I’m hard on the things in my life. I either use them well and often or they sit abandoned and dusty on a shelf… you know metaphorically speaking. When I realized that, it confirmed for me that I really didn’t want a new phone, I wanted a new iPhone. Yesterday, was finally new phone day. We had a little trouble picking one up at the Apple Store because the set up policy they have doesn’t account for some privacy settings that we implemented on our AT&T account, but luckily there was an AT&T store just blocks away. We were only in the store for 10 minutes or so before I walked out with my brand new fully functioning iPhone 3G S. Yes I know it’s been out for forever. Yes yes there will probably be a new iPhone out this summer. Yeah sure iPhones are just mini iPads (still can’t accept that name) with cameras in them. I don’t care. I love my iPhone. Have you ever met me in person? Seen me out and about? Then you’ve seen me with my iPhone. Ever read one of my tweets or gotten an email from me? Chances aren’t bad it was sent from my iPhone. It is so much a part of my everyday life that I truly feared what would happen should my old phone die before I bought a new one. Thank goodness that’s longer a fear… Though I do have to deal with my child nagging me to wipe the old one and tip toe around the delicate feelings of my husband who really didn’t want to be tied into another 2 year contract with AT&T. Those? Both minor prices to pay to pay for a happily functioning piece of equipment that I don’t think I want to live without. The only downish side? Aside from the contract and the inflated monthly rate? I remember fondly setting up my first iPhone and the joy and wonder with which I loaded each new app, built my music library and set up my phone. The transition process was so smooth that I didn’t have to lift a finger, so it doesn’t feel so much like I got a new toy at all, more like my old phone is just enjoying a new life with a shiny black shell. 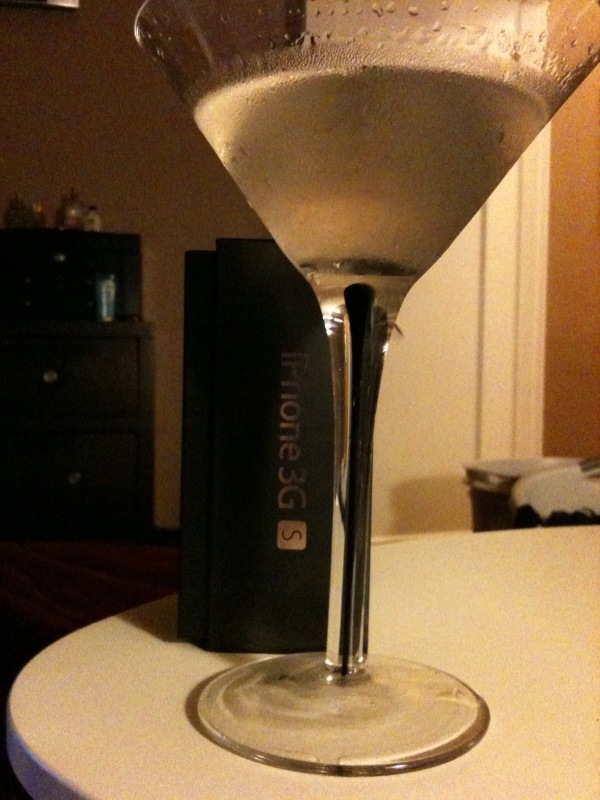 Can’t think of a more perfect complement to an iPhone 3G S than a martini. Congrats on the upgrade! I’m in a similar “want a new iPhone” thing too. I’m out of contract too, but I’m thinking waiting until June. I thought you might get one for your birthday, but hellz yes on getting it early!!! Stephanie is in love with her iPhone too. There would be sadness if anything ‘happened’ to it.